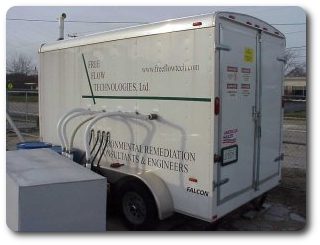 Organics/VOCs Treatment - Free Flow Technologies, Ltd. The ART® Technology is comprised of multiple proven concepts working synergistically to treat soil and groundwater. ART® incorporates the strength of in situ air-sparging, in-well air stripping, soil vapor extraction, enhanced bioremediation/oxidation, and dynamic subsurface circulation cell in a 4-inch diameter well or larger. Because of the versatility of the ART® Technology, it's effectiveness has been proven in various subsurface formations, including fractured bedrock. This technology has had significant success with a broad range of contaminants including chlorinated and petroleum compounds, MTBE, and 1,4-dioxane. The ART® Technology combines in situ air stripping, air-sparging, soil vapor extraction (SVE), and enhanced bioremediation/oxidation - plus subsurface groundwater circulation. The ART® Technology is designed for installation within a four-inch or larger well. The combined remediation concepts and subsurface effects of a typical ART® well are depicted in the Cross Section. The air-sparging component results in reduced water density and lifting (mounding) of the water table in the vicinity of the well. This in turn causes a net negative gradient to the well, resulting in water flowing back toward the well. This upwelling force created by the sparging results in an in-well "packer" concept, resulting in pressure and density gradient from the lower screened interval to the upper screened interval that assists in driving the dynamic subsurface circulation forces. Vacuum pressure (the vapor extraction) component is applied at the top of the well point to extract vapor from the subsurface. The negative pressure from vacuum extraction creates additional water mounding and boosts the net gradient back toward the well; it also removes vapors from the unsaturated zone and well annulus. The SVE and sparging combined in the same well further enlarges the radius of influence and boosts circulation. A submersible pump is placed at the bottom of the well to recirculate water to the top for downward discharge through a spray head. The water cascades down the interior of the well and system piping, providing multiple wetted surfaces for mass transfer, similar to what occurs in a packed-column air-stripping tower. 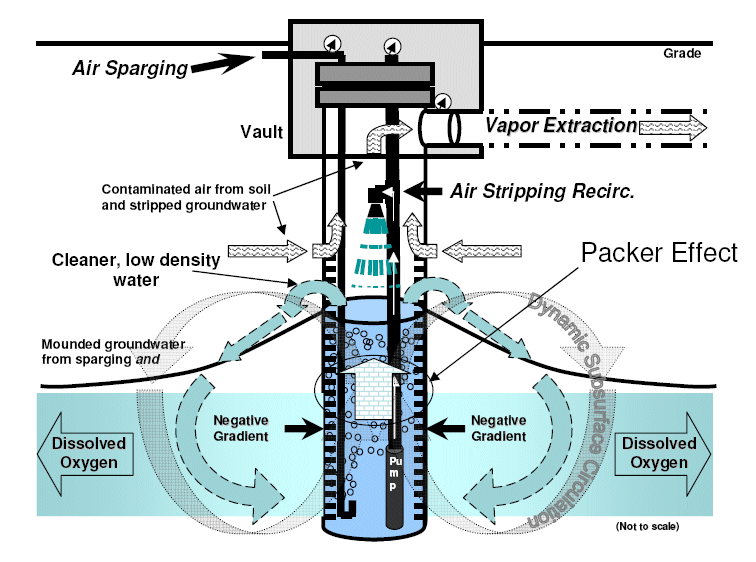 Enhanced stripping via air sparging near the bottom of the well occurs simultaneously. In essence, the well acts as a subsurface air-stripping tower, in which the pumped and stripped, dissolved-oxygen-rich water flows down the well annulus and over the mounded water back into the aquifer and vadose zone. This action hydraulically enhances the radius of influence and flushes contamination from this zone. Ultraviolet treatment units and/or the addition of ozone to the air-sparging stream are options that can be incorporated with the ART® Technology at minimal expense and effort. When these are combined, the synergistic technology effects create a circulation zone surrounding the well that further enhances cleanup. In summary, contaminants are stripped from the water as a result of the combined effects of in-well air stripping and in-well air sparging. The "radius of results," or dynamic subsurface circulation cleaning zone, is created by a combination of negative gradient from air sparging, the application of vacuum extraction, and subsurface water circulation induced by a submersible pump. A radius of influence of up to ten times the water column in the ART® remediation wells has been achieved at sites where the technology was implemented. All of these different components are integrated in the ART® Technology and can be installed in a four-inch (minimum) groundwater well. Another primary benefit of the technology that separates it from similar remedial alternatives is its potential to treat the same unit of water as many times as necessary because of the multiple stripping passes that can be achieved. We are one of a limited number of companies authorized to install and operate a patented treatment technology which effectively treats soil and groundwater contaminated with organic compounds (including 1, 4 Dioxane, PCE, DCE, 111-TCA, etc.). 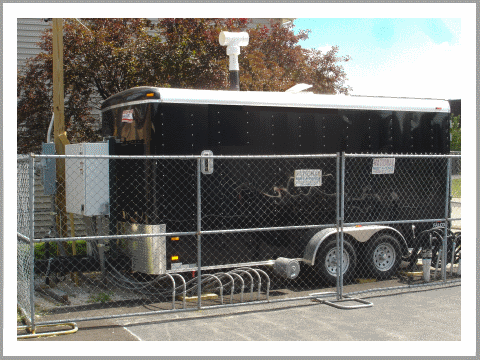 Accelerated Remediation Technologies, Inc. (ART) holds a patent offering treatment technologies which incorporates soil vapor extraction, air-sparging, air stripping, flushing and enhanced bioremediation/oxidation into a single well application. The project site had served as a gasoline service station since the 1960's and had three (3) 6,000 gallon underground gasoline storage tanks and two (2) 1,000 gallon underground oil storage tanks which leaked petroleum products into the surrounding soil and groundwater over a period of years. As a result of the contamination the Illinois Environmental Protection Agency (IEPA) required actions be taken to mitigate the high levels of petroleum compounds including: benzene, ethyl benzene, toluene and xylene to acceptable cleanup levels. A traditional remediation technique, chemical oxidation (CO) was applied at the site. Although the CO technology was initially successful the contamination rebounded to unacceptable levels and after 22 months the IEPA required our client to investigate alternative technologies which would be effective in achieving the cleanup objectives. The ART technology was selected and the IEPA approved a Pilot Study with the intent of making a determination as to the ability of this technology to treat the documented concentrations of benzene and ethyl benzene in the site soils and groundwater to levels below the established cleanup objectives. Upon review of the results of the pilot demonstration the IEPA authorized full scale application to commence. Subsequent testing verified the ART technology successfully reduced benzene by 99.3% within the 90 days and ethyl benzene by 96% within the same time frame. In addition to these dramatic results an estimated mass removal of 1,400 pounds of Volatile Organic Compounds (VOC) occurred during this same 90 day period. In comparison to other technologies, ART typically achieves the acceptable cleanup standards within 30 - 50% of the time it requires other technologies. The compression of the schedule combined with fewer wells and simplified O&M allows clients to recognize significant cost savings over other technologies. One of Free Flow Technologies "Environmental Compliance Services"
Military site cleanup in Alaska. Cleanup at former missle site in Florida. Economical and effective cleanup of US Army firing range. Foundry dust/fumes treatment system - designed and installed by Free Flow Technologies. Free Flow Products Excel in SPLP. - Low dosage FF-200® treatment of mining waste has no problem meeting SPLP standards.